It has been a good day on Everest as climbers are working hard to acclimitize. Teams on the Nepal side are all over the Hill, from base camp to Camp 2 while it’s a similar map on the Tibet side with teams now at Advanced Base Camp. We are hearing from a few climbers who have returned from their rotations, mostly on the south side. The reports are consistent that the Icefall is good, it’s windy in the Cwm and they are having great time. On the way there is a very steep wall of ice with a ladder, followed by some steep climbing with the ascender on the rope. This wall is a challenge! All of us climbed it very well and, puffing heavily, we reached the top and stopped for five minutes. This turned into half an hour as we watched some kind Sherpas essentially rescue someone who couldn’t climb the obstacle, using a 3:1 pulley and rope system. We even contributed a Prussik cord! Another very windy night at C1 and we waited until the sun hit camp before starting our descent to BC. During the walk up to C2 yesterday, we had seen what looked like a small avalanche above C1, with dust falling lower. Turns out that debris had actually fallen into the ice fall and we had a new route down. A very scary reminder that the ice fall is not a place to hang around for too long if possible. The descent was stunning and I managed to take a few photos this time, after checking with Dorje that it was safe to do so! Ladders on the descent aren’t as scary but the steps (lurches in my case!) across the small crevasses are just as bad. We made it back to the comforts of our Mess tent at BC in just over 2 hours – Yummy food, clean clothes and a watering can esque shower. Heaven! Looks like Mingma G Sherpa of Imagine Climb reached Camp 3 on their Lhotse climb. He has suggested they might fix the ropes to the summit but apparently that didn’t happen. The climbers hoping to traverse from Everest West Ridge then the Lhotse Ridge, Horia Colibasanu and Peter Hámor did a rotation to Camp 2 and now are down route to Deboche for a little rest. They are climbing without supplemental oxygen so will need to spend at least one night at 8,000 meters to acclimatize before making their summit push. Anish summited in 2016 from the south and wants to bring the Boy Scout flag to the summit this year. He is a Scoutmaster in Jhapa as well leading a troop of 60 youth. He is from Duhlabari and is the first person from Jhapa district to have summited Everest. He is 24 years old and was raised by his grandparents and aunts and uncles. He sold property and got some local sponsorships for his first climb. This climb he received support from the local municipality and the Boy Scout council, and the Northern Star Council has picked up the rest of the cost for this climb according to Colleen Galloway of the North Star Council in Saint Paul, Minnesota. I’ve written a bit about A 69-year-old Chinese climber, Bo-Yu Xia. He will be guided by Dawa Gyalje Sherpa as he makes his fifth attempt to summit Everest. He has had both legs amputated but is not willing to give up on his dream. Take a couple of minutes to enjoy this video – your daily inspiration! It would appear that the rope fixing is progressing smoothly under the supervision of Himalayan Guides who has the contract this year. Once again the rope fixing equipment was flown to C2, and work has already started on the Lhotse Face, although these last two days have been to windy to work on the face. Garrett Madison has claimed that he is doing this work, despite the fact that he has not even attended one of the EOA meetings concerning the rope fixing. Credit should be due to those who actually do the work, and this is Iswari Paudel’s company Himalayan Guides. This agency is providing the local Nepal logistics to Adventure Consultants, Jagged Globe, Ice 8,000 and Madison Mountaineering this year. Yesterday the rope was fixed to above the Yellow Band, so today the rope fixers are taking a well-deserved rest. Our team arrived at BC earlier than normal as we feel that general temperatures are increasing. Despite various world leaders not recognising this, we are seeing that temperatures are slowly increasing from year to year. Despite being here earlier, the coldest night we have had is -14 C, with another night of -12, otherwise it is generally -10 or -9 where as in previous years it would normally be -18 to -12. We all need to take care of this world. The other thing we are noticing is the increase of EBC trekkers, and the amount of litter and human waste that they are leaving……but also the amount of graffiti they leave on rocks along the way. We as expeditions have taken great care to clean up the EBC, and we must pay $5 per kg to remove our rubbish and human waste, and we have a rule that says we cannot mark any rocks. But trekkers have none of these rules. Trekkers come and take pictures of their own rubbish, poo behind rocks and then blame us as operators on their social media. In two hours our team collected 6 large sacks of rubbish from around trekkers rock, but sorry we are not willing to pick up their human waste. We all complain to the authorities, but like so much in Nepal they take little notice. Following the analysis of the situation and the findings of the organisational committee and the members of the expedition, it was decided that another winter expedition to k2 in the framework of the polish programme Arthur Hajzera, planned for winter 2019/2020. You can read a bit more on Desnivel. Tomorrow, April 25, will be a special day in Nepal as it was on this day three years ago that a 7.8 magnitude earthquake struck the country taking over 9,000 lives. 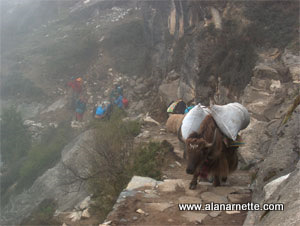 I was on my way to Camp 2 in the Western Cwm hoping to summit Lhotse that season when the quake hit. Tomorrow’s post will be dedicated to that day, the 18 lives lost at base camp and the thousand more impacted across Nepal. HI Alan, thanks for all the great posts and information. Every April I always look forward to reading and seeing the teams and their efforts to achieve their goals. I really just wanted to say that I appreciate this post and the pictures of the ice cliff. More often than not I think people can perceive, incorrectly of course, that Everest is not that technical. The picture looking down is something that looks less technical in my view than the reality picture looking up it. I hope we get to see more pictures like this as the skilled teams climb higher up the mountain. Thanks again for all your posts. Alan – wasn’t the earthquake in 2015? What do you think about filiming Everest climbs? Yes, makes for interesting television. Don't care one way or the other. Don't like it. A major distraction for the climbers.